HP is still around, just in case you are wondering, and it has recently unveiled its latest Chromebook called HP Slatebook 14. 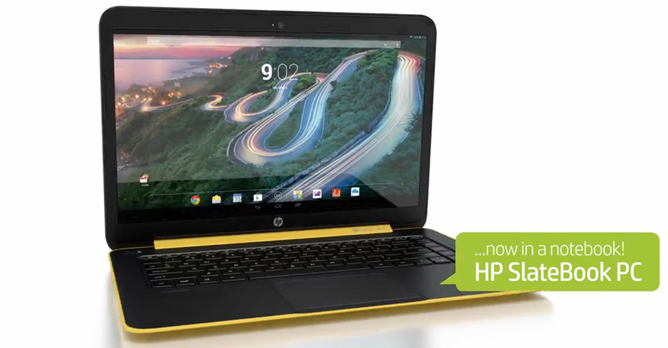 While HP is promoting its latest hardware as a “Chromebook,” it actually runs on Android instead of Chrome OS. The look of HP Slatebook 14 appears like the Chromebook 11 released late last year. The device works just as you would expect Android to work on a PC: a larger home screen, more room for apps, and definitely more functionality than Chrome OS. Also, there are many Android apps that is resolution-independent (enabling to adjust its size regardless of the device’s screen size), enabling you to run programs you normally won’t do with Chrome OS, like Skype (imagine that?). The HP Slatebook 14 is powered by a NVIDIA quad-core processor (making it gaming-friendly), a touchscreen, and a microSD card slot, HDMI port, three USB ports, and a 3.5mm audio port. Even with this partial spec list, you know this is a compelling alternative to Chromebooks, but only at the right price (which HP has yet to announce).